Where might the “wrong track” lead? With Qaddafi at (more or less) one edge of the Arab world slaughtering his own people and the Saudi regime at the other edge closing down all possible room for dissent internally and then moving forces into Bahrain to assist the brutal suppression of those demonstrating for change there, the signal is not so clear. Incidentally, I don’t believe Qaddafi is “mad”. I think he is quite clever and very cunning in a Zionist-like way, and was always prepared to stop at nothing to keep himself and his family in power. The single word I’d use to describe him is evil. I imagine he knew better than anybody else that his statement about his people loving him and being prepared to die for him was complete and utter rubbish. (“B.S” as President Carter once said in another context). But I also imagine Qaddafi calculated that such a statement would cause many correspondents not only to laugh but to write him off as nuts and therefore a leader who could be removed without too much more mayhem. And that, he probably also calculated, would give him more time to organize those of his army units he could rely on and his mercenaries for a counter offensive to crush the rebels for freedom. IF the Obama administration is to be believed, it didn’t have advance notice of the Saudi move. That suggests there might now be some serious tension in the U.S.’s special relationship with Riyadh. What could be the real cause of it? US Secretary of State Hillary Clinton was right when she said in an interview with CBS that the Gulf States were on the “wrong track” in sending troops to Bahrain. 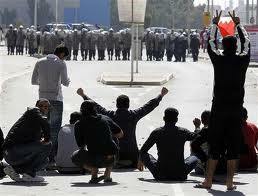 She added: “We find what’s happening in Bahrain alarming. We think there is no security answer to the aspirations and demands of the demonstrators,” (It’s also true that there’s no security answer to the aspirations and demands of the occupied and dispossessed Palestinians). Question: Where does the wrong track that Qaddafi, the Saudis, the Bahraini’s and other autocratic Arab leaders and regimes are on lead to? It seems to me there are two possible answers. One, as Zionism has demonstrated in its own context, is that if corrupt and repressive Arab regimes are prepared to be brutal enough, and even to commit war crimes against their own people (as I believe Qaddafi and the Bahrainis with Saudi complicity are doing), they may buy themselves some more survival time. But brutal repression will ultimately be counter-productive and feed the fire of Arab rage. In this scenario the regimes of a corrupt and repressive Arab Order are committing suicide, and change with a democratic face will come. The Arab peoples will be liberated from their own tyrants. Arab Spring becomes Arab Summer. In the other possible scenario, Arab Spring becomes Arab Winter. This because autocratic and repressive Arab leaders and regimes succeed (with America’s secret and unspeakable blessing?) in reconstructing the walls of fear which until the start of this year imprisoned their own peoples. In this scenario the main beneficiaries are most likely to be Al Qaeda and Co. (my shorthand for violent Islamic extremism in all of its forms). I am not suggesting that Arab peoples who have been demonstrating peacefully for change will give their active allegiance and support in great numbers to Islamic groups and organizations which preach the need for and practise violence. I mean only that the re- suppressed rage, despair and loss of Arab hope for something much better will create environments in which violent Islamic extremism can take roots and grow. To understand why, it is necessary to have some idea of the essence of how terrorism can be defeated. Terrorists cannot operate, not for long, without the cover and the practical, emotional and moral support of the community of which they are a part. When that community perceives itself to be the victim of a massive injustice, and if that injustice is not addressed by political means, the community will cover, condone and even applaud the activities of those of its own who resort to terror as the only means of drawing attention to the injustice, to cause it to be addressed. It follows that the way to defeat terrorism – the only successful and actually proven way – is by addressing the genuine and legitimate grievances of the host community. The community will then withdraw its cover and support for its terrorists; and if they continue to try to operate, the community will oppose them by exposing them – reporting them to the authorities if reasoning fails. As I go on to say, there are many case studies to support that analysis. In Northern Ireland, for example, the British Army did not defeat Provisional IRA terrorism. The terrorists called off their campaign when they had no choice – because the Catholic host community would not cover and support them any longer. And that happened only because the British government summoned up the will, about half a century later than it should have done, to risk the wrath of militant Protestantism by insisting that the legitimate grievances of the Catholics of Northern Ireland be addressed. Modify and apply that to the Arab world if autocratic and repressive leaders and regimes manage to cling on to power by ever more brutal repression and you can understand why Secretary of State Clinton and her boss are alarmed (they damn well should be!) by what is happening. My last post was headlined Could pariah status spell the end for Zionism? A possible alternative headline for this post is Could pariah status spell the end for autocratic, corrupt and repressive Arab leaders and regimes? (I probably won’t be writing much if anything for the next three weeks because I’ll be on a lecture and debating tour of South Africa with my very dear anti-Zionist, Jewish friend, Dr. Hajo Meyer). The Arab lobby once again dragged America and the UK into a war to protect Arab interests. Will it never stop? How many wars will those countries have to join for the sake of Arab interests?